BRYAN EATON/Staff photo. Salisbury Santa's Helper volunteers Missy Barhite, left, and Nancy Barry finish organizing and bagging gifts for children in the program started in 1971 to make sure all children in Salisbury will have presents under the Christmas tree. 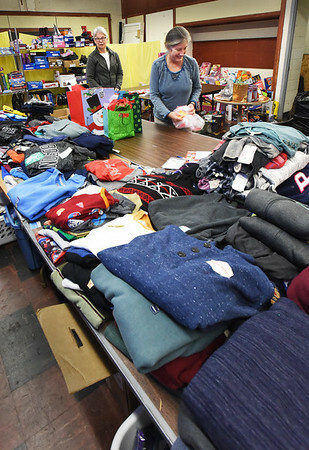 A fundraiser was help in November at Blue Ocean Event Center and the presents are to be picked up by volunteers dressed as Santa and the deliveries made to home tonight. Many people also made donations of gifts and checks to the nurses office at Salisbury Elementary School, many anonymously.